I’m at a loss as to identifying the culprit. This door is rarely used, and this construction is only visible when the door is ajar. 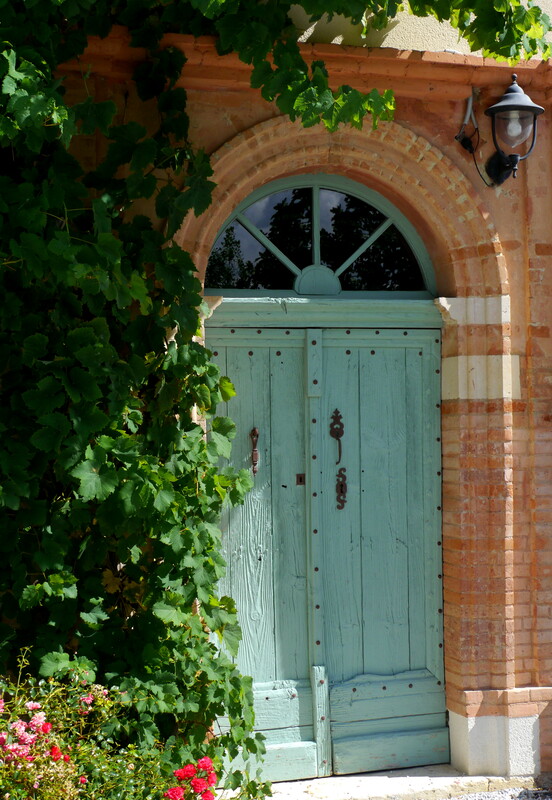 A lovely old vine grows around the door, and the bunches of grapes are popular with wasps (and birds). The door is so old and weather-worn, its doesn’t exactly seal hermetically – and offers living accommodation to various creatures, from spiders to snakes. The baby grass snake falling onto Andy’s head when he answered the door is an incident I would very much like to forget. To Let : single roomed accommodation, internal diameter 7mm, would suit ??? I would be most grateful for any pointers, so I know what creatures are now making themselves at home in the door jamb. Hopefully its something that repels snakes! Thanks, thats useful – will be on the look-out for further proof – with that thin middle, if it is the potter wasp then they should be easy to identify. Its only just occured to me why an hourglass waist, is also refered to as a wasp waist! I get weird pods like that in rows and I’m pretty sure they are wasps – not sure what type. I think you’ll have to look elsewhere to find something to scare your snakes. Thanks Laura – top tip. I did half suspect that it would be a wasp – not my most favoutite creature. Will see if I can get any proof positive. 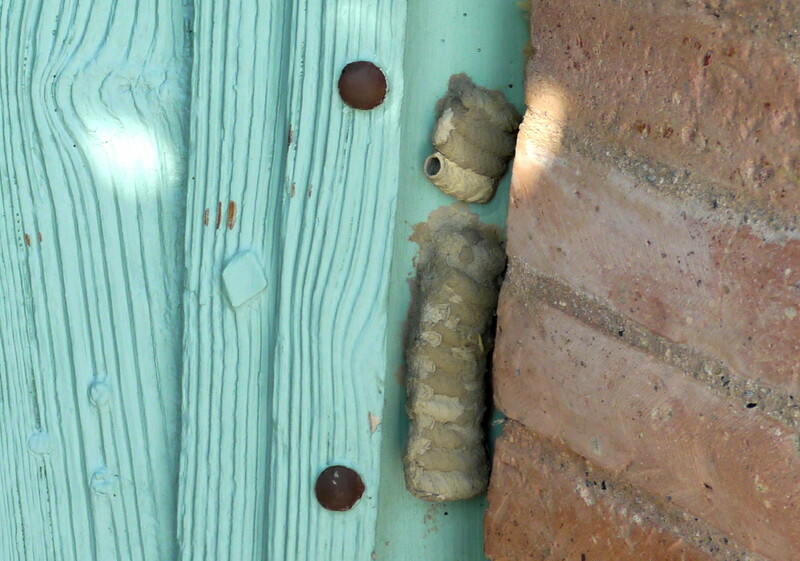 We have tons of mud daubers in Texas that make nests like that. The good thing is they are rarely aggressive and really don’t sting. They prey mostly on spiders. So, the culprit indeed seems to be a wasp – I have yet to spot one, but am now on the lookout. Yesterday, I found some similar pods attached to a garden cushion – and broke one open – it was full of little spiders – some still alive. Thanks for the feedback. 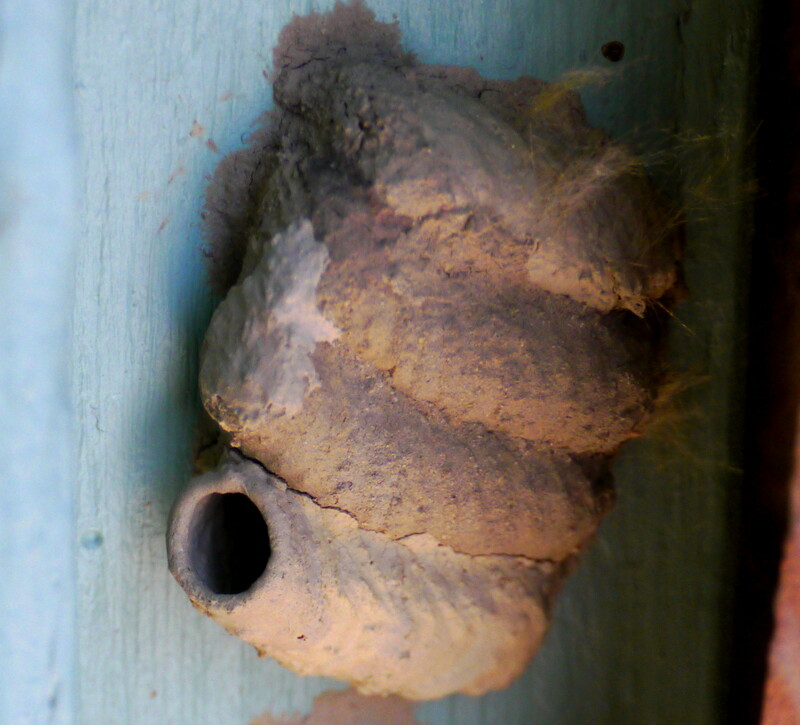 I believe Mamma wasp puts small critters in the pod with an egg so her little darling has something to eat when it’s born. You can sometimes hear noise coming from the pod when the “meal” is trying to escape. Totally CREEPY if you ask me. I hope I’m wrong about what goes on, but I’m probably not.